Here’s some more reviews of The Path. We remain impressed by how well our experiment is received. Hopefully this encourages more developers to take the path less traveled. It’s definitely different from anything else you’re likely to play; it might not be a game many people will like, but it is something to be respected and admired. 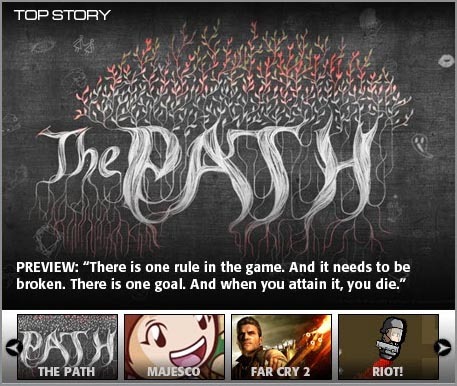 The Path is a hugely significant work in terms of what a video game can be beyond the realms of throwaway entertainment and is potentially a seminal moment in video games. This game is completely subjective, like a puzzle of a starry sky made out of perfectly square pieces. So, I’ve read a TON of theories behind the meaning of the game in general. I don’t agree with any of them, and at the same time, I agree with all of them. I don’t think there is one right or wrong way to look at The Path, and I really love that. The horror. A good innovation and a different way of playing that definitely leave a mark. Do not miss it or become “Zombie”. The Path’s style of horror isn’t the overt kind where a zombie suddenly crashes through a window. It’s a feeling that lurks at the back of your brain, bubbling up during periods of intense personal change. It’s the terror of encountering the unknown; the fear of the revelations a new experience might produce as well as how it might afterward manifest itself in your thoughts and world. It feels like being the only person laughing in a cinema – except the film you’re watching is Schindler’s List. To tell the truth, we are little bit -but happily- surprised by the amount and depth of attention that The Path is receiving. Once again, we may have underestimated the videogame audience. Or underestimated how ready the games industry really is for something new, for a different approach to gaming and game design. There’s of course the expected violent eruptions of hatred here and there. Each of our projects has received them. The Path is no exception. But there’s very few of these. It’s heart warming to hear how deeply people are moved by our story and how encouraging they are of our unconventional design style (and forgiving of its technical shortcomings 😉 ). Here’s a first batch of reviews. But many more will surely follow as dozens of journalists are currently playing the game and writing reviews. A game where you’re never quite sure what’s going on, but always conjuring up another fascinating theory. A game without a story, but with an abundance of meaning. A work of art. An interactive poem. I kind of don’t like the game. This is not a criticism. If anything, it’s the highest compliment I could pay it. The Path isn’t much of a game. But whatever it is, it’s one hell of one of those. It is almost easier to think of The Path as an experience, rather than a game. An unsettling, otherworldly adventure, which players scour for hidden meanings and analyze outcomes. The game isn’t focused on violence. Rather, it’s an introverted, slow-paced game with a story that hooks you. The player has a lot of freedom to explore the game world, without a directed path, despite the name. Perhaps the single most stunning thing about The Path is how well it melds each component of itself together, creating a single entity and providing equal importance for each part of its self. There’s also a rather in-depth interview on Core Gamers where we talk about all sorts of things, not just The Path. For the people in Brazil and Portugal who can’t wait, Acid Rain has published a hands-on preview of The Path. It’s like the beta of The Path is making a tour through Europe. Claudio Todeschini wrote an interesting preview on Games Village about how The Path is not exactly fun and offers a deep emotional experience instead. He explores his confusion further in an editorial article about the meaning of the word videogame. It’s nice to see how much thought our little project can provoke. Though we personally think The Path can be fun. Perhaps just a different kind of fun. The Austrian kids at Random Rocket have interrupted their usual menu of war simulations and Ego-Shooter for a little stroll on The Path. Auf Deutsch, selbstverständlich. And before we forget, Dutch-speaking French Belgian ClémentXVII posted a wonderfully written preview of The Path on Factor News. If you know even a little bit of French, I highly recommend it. Philip Cremers heeft een artikel geschreven over zijn ervaringen bij het spelen van een beta versie van The Path. Als het korte wachten je teveel wordt, kan je je even gaan laven aan zijn bron: hier. This post is in Dutch because it refers to an article written in Dutch. The Path will be released in English and Dutch. Dutch my mother tongue. The discussion of some of these plot points might be considered spoilers in other games but since the focus of The Path is squarely on your visceral reactions and not to the actual narrative importance of the events themselves, we can be fairly specific about what happens without ever really compromising the experience that the designers intended. Meagan VanBurkleo was so nice as to publish a preview of The Path on the website of Game Informer (probably the biggest computer magazine in the world). We let her play a beta version of the game and she reports on the experience. Warning: spoilers! 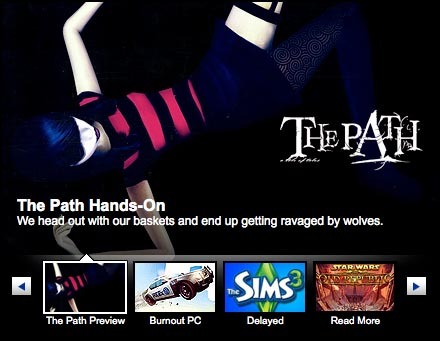 And meanwhile, we are closing in on a launch date for The Path! The exact date isn’t determined yet but unless something unforseen happens we believe the game will be ready in March or April! We’ll let you know as soon as we do! We just received a magazine, which I believed is called Gameland with a spread about The Path. Thanks, Ilya! And next month, Igromania, possibly Russia’s biggest game magazine, is going to publish a preview. They had already posted an extensive article about the game on their website last year. We have also been approached by several Russian publishers who want to distribute the game in stores. I guess people like original PC games over there.